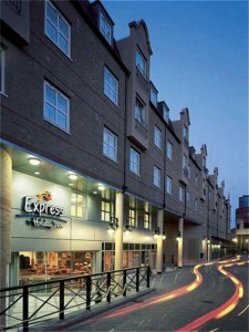 The Express by Holiday Inn hotel in London Hammersmith is in close proximity to both Hammersmith tube station & Hammersmith Broadway, allowing easy access to both central London & Heathrow Airport. Our Hammersmith hotel is also within two miles of the exhibition halls of Earls Court & Olympia & within walking distance to the Carling Hammersmith Apollo theatre.This hotel is not in the Congestion Charging Zone. The 135 bedroomed Express by Holiday Inn hotel in London-Hammersmith is a contemporary & stylish hotel offering refreshing simplicity, car parking & value for money. It is situated on the north side of King Street, Hammersmith. Our West London hotel is constructed on a site that was originally home to Fullers Brewery & incorporates the original distinctive facade of the Fullers Building.All bedrooms at Express by Holiday Inn hotel in London Hammersmith are air-conditioned, equipped with en-suite facilities, power shower, direct dial telephones, modem points at work stations & satellite television. Our great value rooms can accommodate up to 2 adults & 2 children, or up to 3 adults (#30 surcharge for 3rd adult) & our rates include a complimentary continental breakfast buffet.The Express by Holiday Inn hotel in Hammersmith also provides a purpose-built Meet Smart meeting centre, catering for meetings of up to 35 delegates. The hotel has wireless internet in the public areas. Furthermore, we offer covered parking.